In Scandinavian folklore, there is a story about a lethal pig, the Gloso (‘glowing sow’), which kills lonely hikers on their way home at Christmas Eve. The pig is black with glowing, red eyes, and its back is a sharp saw: running between humans’ legs, the creature cuts humans in two parts. The only way to survive a Gloso is to jump into the ditch as soon as you spot the animal’s glowing eyes from a distance. Stories about lethal pigs are also found in Celtic mythology, in the tale about Mag Mucrime, pigs from the underworld, which haunt and ravage the lands, killing people and destroying the fields. However, the ancient Celts were also very fond of their pigs. Typically, helmets and shields of Celtic warriors were decorated by boars – and we should not forget that a pig is in the centre in one of the most important Celtic epic tales, the story of Mac Da Thó’s pig. Likewise, in Germanic mythology, the pig is the animal of the god of fertility, Frey, and the boar Sæhrímnir, which can be eaten again and again, plays a central role as provider of meat to the dead warriors and the gods od Valhalla. 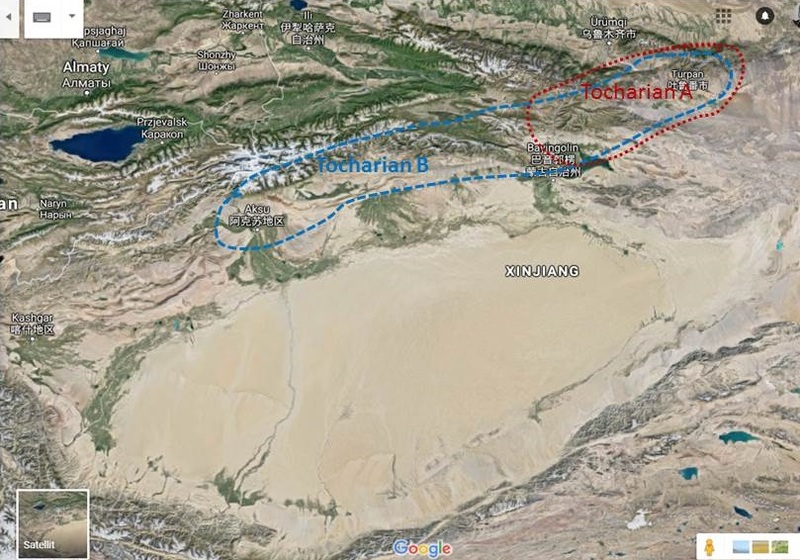 How come that the most important protein source to ancient Neolithic farmers had such different roles in various cultures of the Eurasian continent? Banned in some cultures, worshipped in others, and in other associated with death and the netherworld – apparently, the pig did not stay neutral to ancient people. Our answers are partly found in language. Like the cow, goat and sheep, the pig belongs to the earliest domesticated animals, dating back to 10-11,000 BP in Anatolia and West Asia. Very likely, the first pigs were wild pigs attracted to human settlements by the waste. The early farmers, who very quickly must have understood the value of pigs as a protein source, successively domesticated them by killing the males and keeping the females for reproduction. In fact, even today, pigs are the most effective protein source of farming, besides chicken. The great danger associated with the hunting of wild boars must have contributed to the early farmers’ high esteem of pig domestication. Domestication of pigs spread with the spread of farming, but for some reason – maybe that pigs are useless for herding or that they are easily infected by sickness – the domestication did not reach as far as the domestication of cow, goat, and sheep. Pigs are extremely unusual in Ancient Egypt, and pig domestication never reached Central Asia. In parts of West Asia and Anatolia, there was a decline in pig domestication already in early antiquity, something that was later transformed into a complete ban though religion, as in Judaism and later on also in Islam. In cultures where pig domestication was continued (Eastern and Western Europe, and the Mediterranean), the pig received a dual role in cultures: it was both an animal associated with death and the underworld, worshipped in chthonic sacrifices, as well as an animal symbolizing fertility and prosperity. This is found both in Graeco-Roman, Celtic, and Germanic mythology. Can linguistics help us solving this enigma? 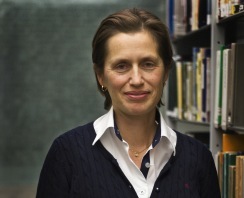 There are several ways of investigating cultural patterns by language: either to look at the origin of words and their etymology down to the proto-language, or to consider the colexification patterns (meanings that co-occur in a language) and the meaning change patterns of words in genetically related languages. Stability and spread of cognates, as well as borrowing tendencies are important methods as well. 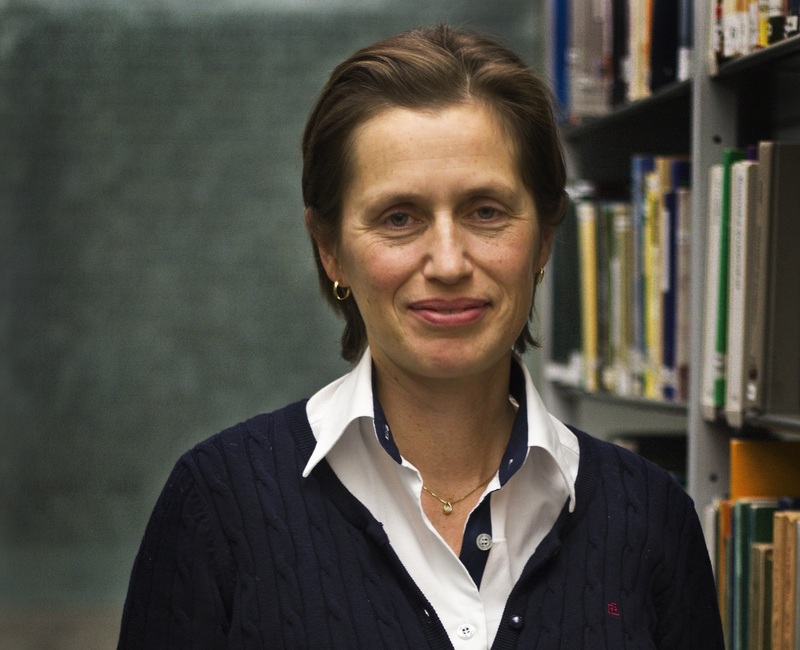 If we look at linguistic reconstructions, the picture is complex and interesting. Pig words, including a general word for ‘pig’ (generic), which is often the same as ‘sow’, as well as ‘piglet’, can be reconstructed to Proto-Indo-European (PIE *suH- ‘pig’, PIE *porḱo- ‘young pig, piglet’). These lexical roots, which had the meaning of ‘pig’ and ‘piglet’ already in the proto-language, indicate the Indo-Europeans had domesticated pigs. They are represented in a vast majority of pig words in Indo-European languages. Besides, some sub-branches replaced the forms or added new words for the pig terms. In Germanic languages, the male pig was derived from a root meaning ‘infertile’ (PGm *galtan- ‘boar’ < *gald(j)a- ‘infertile’ < PIE *ghol-tó-), indicating that male pigs or boars were gelded rather than killed. 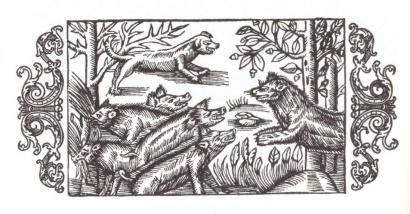 Several languages created new lexemes by referring to the grunting sound of pigs, such as Lithuanian čiūkà, kūkà ‘pig’ (Balto-Slavic *kyaw-, *kyū- < PIE *kew-, *kū- 'to howl') or Old and Modern Irish cráin ‘sow’ (Proto-Celtic *krākni- 'sow'). Some languages used the wide-spread Indo-European root for ‘young of animal’ (PIE *wetso- 'young of animal' < *wet- 'year'). The wild boar has its own root in Proto-Indo-European (PIE *h₁pr-o- '(wild) boar'), e.g., Latin aper, but very often, this root comes to represent both the wild and domesticated male pig, such as Croatian vȅpar, German Eber. Several languages use the Proto-Indo-European root PIE *h₂wŕ̥s-en- 'male' for the wild boar, such as Sanskrit varāha-, Hindi varāh, bā̆rāh. Else, a combination of a root meaning ‘wild’ and the root PIE *suH- 'pig' is very frequent, as in Bulgarian díva svinjá, German Wildschwein. 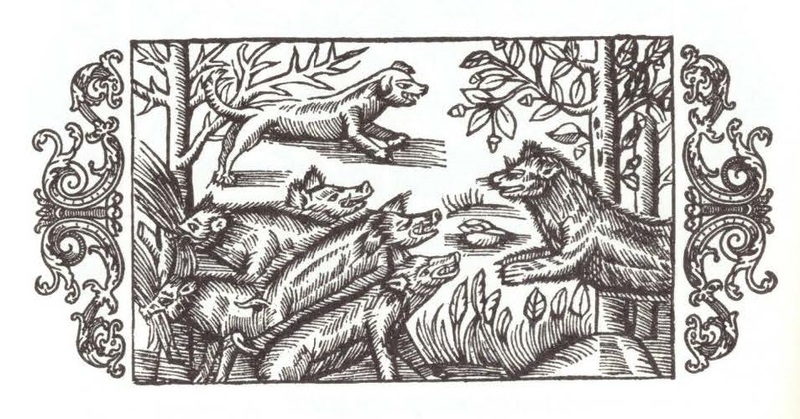 In general, words with the meaning ‘wild boar’ also frequently mean ‘(domesticated) boar’, something that indicates that the wild boar was represented by the (male) boar, in contrast to the (female) sow, which represented the domesticated pig. Caucasian proto-languages, Proto-Kartvelian, Proto-North-West-Caucasian, Proto-Nakh, and Proto-Dagestanian all have reconstructed words with the meaning ‘pig’ (PKv *ɣor- ‘pig’, PNWC *ɣaw- ‘pig, piglet’, PN *eɣ-ə ‘pig’; PD *bol’- ‘pig’, PKv *burw- ‘gilt (female pig, 3-12 months old); suckling pig’, PNWC *bl˜’-ə ‘sow, female pig’, PN *borl’- ‘colourful’). This clearly points out that the early Caucasians domesticated the pig, something that we know they did early on. Uralic, on the other hand, borrowed their pig words from Indo-European or Iranian (Proto-Finnic *sika ‘pig’, Proto-Finno-Ugric *porśas, *porćas, loan from Indo-Iranian), indicating that the early Uralic tribes did not domesticate the pig – they adapted pig domestication from Indo-European tribes. However, the patterns of meaning change and colexification of pig words give an interesting picture. First, pig words often change to the meaning of other animals, often large and ‘chubby’ animals, such as ‘elephant’, ‘stallion’, or ‘camel’. In particular, this is the case in Caucasian languages. The domestic pig occasionally points in the direction of negative connotations, such as ‘filthy person’, ‘immoral person’, ‘fat’, or ‘greedy’. However, meaning changes and colexifications in the direction of power and fertility are frequent, such as 'bull', ‘hero’, ‘powerful’, 'king', ‘manly’, ‘chieftain’ and ‘husband’, in particular with the (wild) boar. It is obvious that ancient people both worshipped and admired their pigs, but language indicates that they most of all respected the wild boars, probably because they were dangerous and hard to hunt. The domestic pigs were highly evaluated but also, apparently, looked down upon. The dangerous pigs we know from mythology have not given much imprint on language. Carling, Gerd (To appear (2019)), Mouton Atlas of Languages and Cultures. Vol. 1: Europe, Caucasus, Western and Southern Asia (Berlin - New York: Mouton de Gruyter). 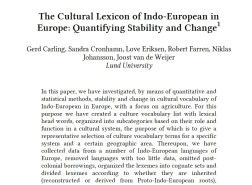 Gamkrelidze, Tamaz Valerianovič, Ivanov, Vjačeslav Vsevolodovič, and Winter, Werner (1995), Indo-European and the Indo-Europeans : a reconstruction and historical analysis of a proto-language and a proto-culture (Trends in linguistics. Studies and monographs, 99-0115958-X ; 80; Berlin: Mouton de Gruyter). Larson, Greger and Fuller, Dorian Q. 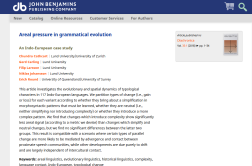 (2014), 'The Evolution of Animal Domestication', Annual Review of Ecology, Evolution & Systematics, 45, 115-36. Mallory, James P. and Adams, Douglas Q. (1997), Encyclopedia of Indo-European culture (London: Fitzroy Dearborn). Hyllested, Adam 2017. Again on ancient pigs in Europe. 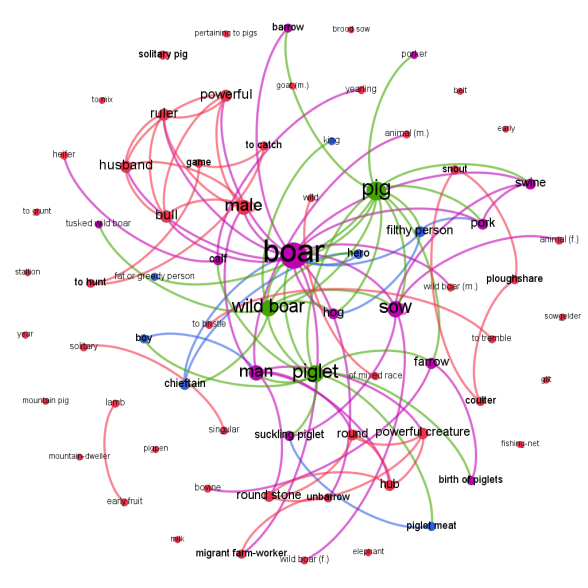 Semantic network of colexifications (blue, purple) and meaning change in etymologies (red) of the core concepts (green) PIG, WILD BOAR, and PIGLET in 85 Indo-European languages. Graph by Niklas Johansson. Welcome to visit the infrastructure and lab DiACL. All data is open access and free of use to everyone!